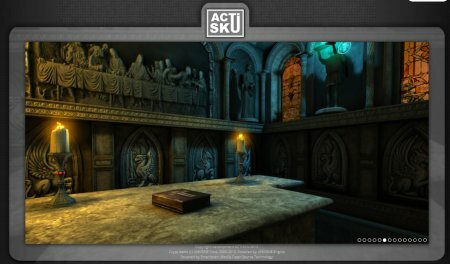 Mozilla announced a new WebGL demo: Crypt Demo. This Crypt Demo is a great example for how far browsers have come and for the cross-platform experiences developers can now create without having to rely on plugins. The demo is written by ACTISKU‘s Anthony Liot. The demo should run in most modern browsers that support WebGL on systems that have new enough graphics card (it does not work on Internet Explorer because it doesn’t currently support WebGL). I tested the demo on Firefox where it worked well. Take a look around this candle-lit Crypt developed Unigine. iOS 8 release: WebGL now runs everywhere. Hurrah for 3D graphics! Today, Apple drops iOS 8, and whilst most of Cupertino’s fanbois will be quantifying themselves with HealthKit, flashing their lights with HomeKit, or configuring their greatly expanded notifications capabilities, one of the most significant changes in its mobile operating system has mostly been ignored by Apple. Cupertino ukase – has implemented full support for one of the newest and most exciting HTML5 technologies, WebGL. The disconnect between a user base who could play with VRML and a developer community that couldn’t was one of the reasons VRML withered on the vine and faded away. By the start of this year, WebGL had matured into a stable 1.0 release, shipping inside Firefox, Chrome and Opera, and IE11. Starting today, three billion devices can render WebGL content. Developers no longer need to worry about whether a device can render WebGL content. This changes everything. Yet WebGL is much bigger than games. 3D is a media type – just like text, images, movies and sound – but one that’s had no native integration with the web. WebGL provides a common platform for the creation of 3D interface elements, everything from ‘flipping a page’ (which can be simulated in CSS) to flying through a Gibsonian sprawl of real-time data.